Artist Eric Daigh makes mosaics with pushpins. It's no big deal really, I've already mastered the smiley face (the tricky part is the eyes). Daigh gets his multi-colored packs of 500 pins through local retailers. He and his wife, Meghan, sometimes spend their evenings sorting pins into the five colors he uses. Push pins don’t come in black, so Daigh has to spray paint green pins to black. After breaking the image down to a low resolution, Daigh produces a row-by-row grid that dictates where each color pin should be placed to form the image. Daigh then places the pins, one-by-one, following the grid map. 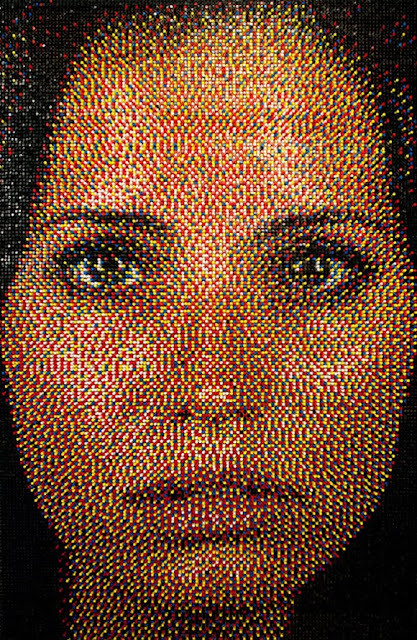 It takes some 11,000 push pins to complete one of his 3×4-foot works.